Amusingly, elements of this episode echoed an installment of Land of the Lost that we enjoyed just a month ago, “Gravity Storm,” which Daniel didn’t remember very clearly, I’m sad to say. He was quite confused about why airplanes and things were being dragged out of the sky, but loved the spectacle. Bizarre physics and aerodynamics are at the forefront of the show, and it’s a ridiculous, wild ride. At one point, Alan tries to reassure Scott that he’d flown a maneuver not unlike the one Brains is recommending. “…of course, I was in space, and wasn’t towing a jet…” We loved it, and the grown-ups laughed out loud. Also, the episode kind of drives home what I was saying recently: as soon as sabotage is suspected, Alan immediately blames the Hood. He’s wrong, as it happens, but the show does need some new villains. 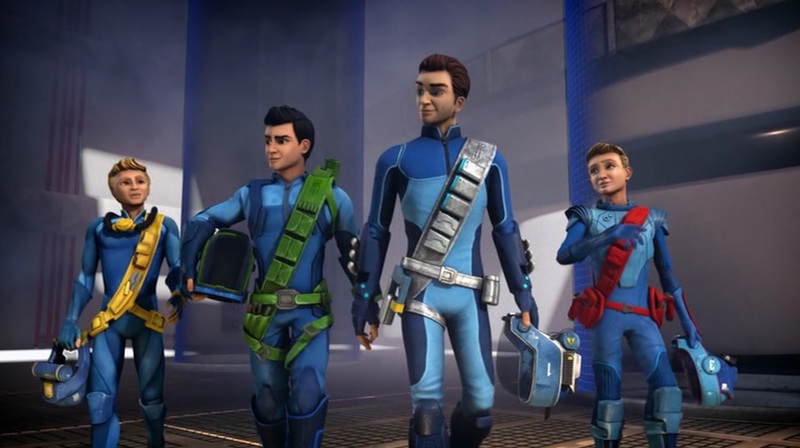 And so we say goodbye – for now – to the new Tracy Brothers as we reach the end of the first American season. It has been awesome. Everybody behind the scenes of this show deserves a round of applause, and I sincerely hope that the series is a success for Amazon Prime and they will bring more episodes to the US. In the meantime, thirteen more episodes have aired in the UK and a further 52 – you read that right, 52 – are in production. I look forward to seeing more soon… and so does our son!